« Peter McRae – R.I.P. Good Afternoon Sensei George Mattson, I was tasked with forwarding this information to your attention Re: the passing of our Senior Sensei – John Bassett. My Teacher Sensei Curtis Smart will be hosting a memorial service “Celebration of Life” for family friends Saturday May 26 at 1393 Pineapple Avenue, Eau Gallie, FL 32935 at 5 PM. We were hoping you could post something in you Memoriam section of your Uechi Ryu.com web site. 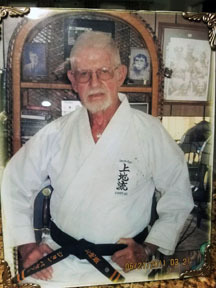 Sensei John Bassett has operated an OKA Dojo in Melbourne FL continually since 1978 after Sailing to Florida from his previous home in Vermont and his Plattsburgh NY Dojo. John joined the Marines at the age of 19 years old. He was married and has 3 daughters and many great grandchildren which whom he enjoyed fully. WHile in Florida he cared for his mother during her latter years. Another special woman in his life Kathleen Parks (Shodan) and her husband Jim have always remained close to John. John worked night security for Harris Corp. until his retirement. He lived locally but spent most of his free time on his wooden sailboat the “Donna Lee” named after his daughter who loved sailing the St. Lawrence River with her father. Many Friday Nights after a workout he and his students would pack into his sailboat to watch the Kung Fu TV series. Saturday morning workouts were held at the beach and Sunday workouts often followed with fellowship at the neighborhood pub. The Melboune Dojo was under Toshiyuki “Tosh” Itokazu. Tosh loved visiting our Dojo and sailing with John. Every Workout consisted of fingertip and knuckle push-ups which helped prepare us students for the Tosh visits. Upon the passing of Sensei Itokazu passing Sensei James Thompson accepted Johns request to be our Sensei. John had the opportunity to visit Sensei James Thompson when we had a week long Seminar with Black Belt testing in March 2018. Upon completion of our seminar Curtis asked me to take a look at Sensei Bassett’s Legacy and look up one of his first students – Gordon Breyette. This allowed me the opportunity to reach out to Gordy (Seizan, Okinawan name given by Sensei Toyama) and reconnect John with one of his early students. John Enjoyed reading up on Seizans accomplishments and seeing pictures of the Okinawan Dojo, with his own Yin Yang artwork on display. John will be missed by his students and many in Brevard County. He will surely be met by students past (ie. Al Michels) and his late wife Charlotte. RIP Sensei John Bassett.